Sunflowers...everyone loves them, I think. For most of use, they represent the warmth of the sun, hope, and beauty. 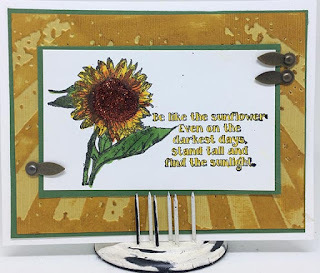 The Face the Sunshine stamp above features a sunflower, along with the sentiment: "Be like the sunflower: Even on the darkest days, stand tall and find the sunlight." I colored the sunflower stamp with Copic markers, and added pumpkin glitter to the center of the flower. 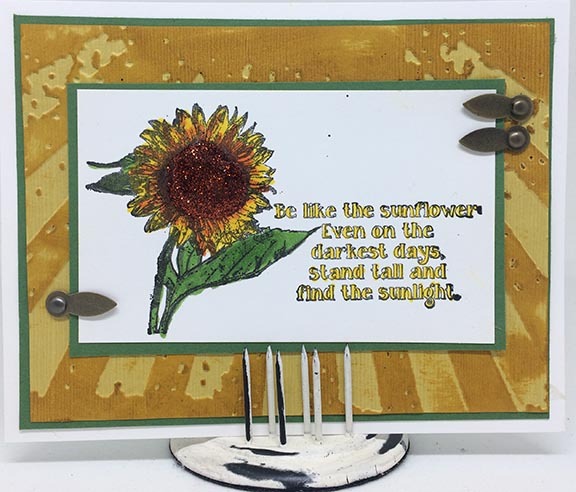 The background uses an embossing folder that I thought simulated beams of sunshine. I think the stamp is a great reminder to keep positive and look for the good in everything! Over the past year, Technique Junkies has released several stamps in the Palettini line that have been very popular, featuring large faces. We have taken several of these faces from the Let's Face It stamps and brought them to you in a smaller format, in a set called Beautiful Faces. 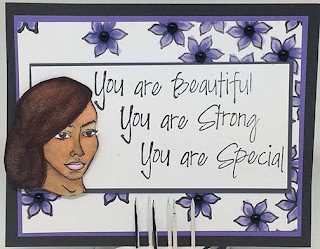 Along with the faces, I added sentiments: "You Are", "Beautiful," "Strong" and "Special." The background in this example uses the Falling Flowers Background stamp. I colored this with Copic Markers, and placed black gems over the flowers. Hi! 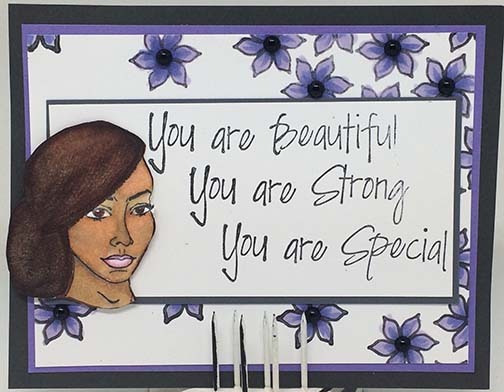 Today is May 1st - Release Day at Technique Junkies, and we are celebrating the release today with a Design Team Blog Hop. If you have arrived here from Tonya's Blog, you are in the right place. If this is your first stop, I urge you to go back to the Design Team Blog to start the hop (the artwork on that page was all done by me,also). Of course, as always, the newly released May stamps are 15% off through May 8th! I hope you have been inspired by the art you have seen from our talented team so far. Here is a little more eye candy for you! This first piece uses the Measure Herself stamp. 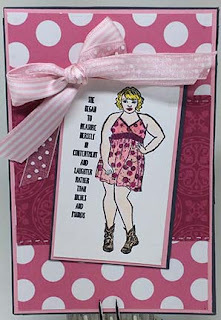 I love the saying on this stamp: "She began to Measure Herself in Contentment and Laughter rather than inches and pounds." I just think it is such an appropriate saying for all of us! This piece uses the Falling Flowers Stamp with the Life Full of Love Sentiment. 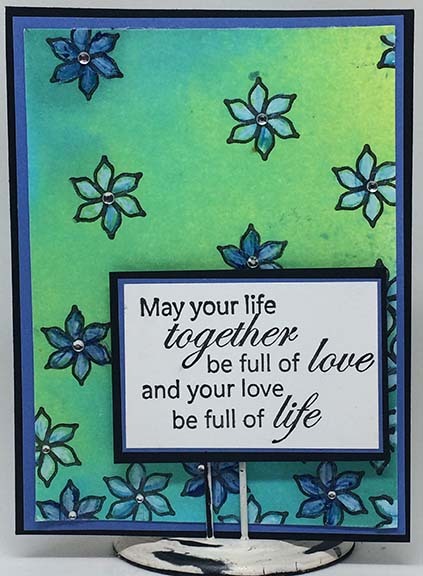 The background flowers were colored with Art Anthology Baby Blue Eyes Sorbet and Honolulu Blue Sorbet, and then the background was colored with Grass ad Waimea Bay Colorations. I think the Life full of Love sentiment is perfect for weddings, engagements and every celebration of love!